The Guyana government is appealing for national unity to help preserve the South American country’s territorial integrity. 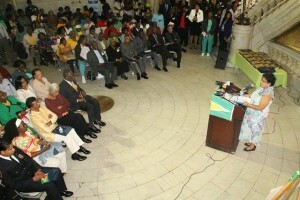 Issuing the appeal to about 300 attendees was Minister of Social Cohesion, Amna Ally in an address at a Flag Raising Ceremony held at Newark City Hall, New Jersey, United States to mark Guyana’s 50th Independence Anniversary. “Our APNU+AFC government recognises that the sustainability of our political, economic and social development and territorial integrity can only be achieved and secured through a socially cohesive and unified Guyana,” she said. Ally’s remarks came less than one month after Venezuelan soldiers fired at a boat that was transporting mines officers of the Guyana Geology and Mines Commission (GGMC) in Guyanese waters about one mile from Eteringbang Police Station. “The destiny of this modern Caribbean country can only be shaped through a unified national identity of being Guyanese,” said the Social Cohesion Minister. Neighbouring Suriname also claims the New River Triangle. Minister of Social Cohesion, Amna Ally addressing a 50th Independence Anniversary event at Newark, New Jersey. The Social Cohesion Minister credited late Guyanese founding fathers- Cheddi Jagan and Forbes Burnham- for securing independence from Britain on May 26, 1966 and building national and regional institutions and creating a national identity through a number of symbols. At the event, folk songs and steel pan by the Buxton Steel Orchestra were played before and during the event that was held in the rotunda of Newark City Hall. Touching on Guyana’s domestic political situation, she assured that the now more than one-year old David Granger-led administration possessed the “political will” to develop the country to achieve a good life and national unity. Ally reiterated that one of the goals of the new government was to bring an end to racial bickering. “Ladies and gentlemen, let me tell you that there is the political will in Guyana under the David Granger-led administration to develop our country,” she said in pursuit of the good life and national unity. “No longer will racial division, antagonism be permitted to continue. The APNU+AFC coalition government recognises that its duty is to govern in the interest of all the people of Guyana,” she said. 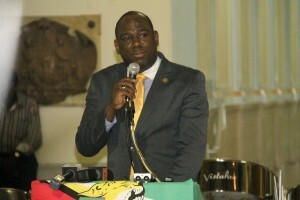 Chairman 50th Independence Anniversary Celebration Committee (New York), Rickford Burke delivering remarks at Newark, New Jersey. Witnessing the flag raising ceremony were the Social Cohesion Minister, Public Infrastructure Minister, David Patterson and Retired Guyana Defence Force (GDF) Colonel, Desmond Roberts who hoisted the Golden Arrowhead for the first time in 1966 to usher in Guyana’s independence. 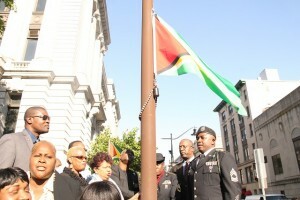 Participating in the ceremonial aspect of the event were several members of the New York Police Department (NYPD) who are of Guyanese roots. Chairman 50th Independence Anniversary Celebration Committee (New York), Rickford Burke called on Guyanese to invest in their homeland. “The human, financial and other capital in the Diaspora are abundant and sometimes under-utilized, hence the Disapora must now play a vital role in the development of Guyana,” he said. The Independence Anniversary Celebration Committee was made up of 167 members in eight states.